Fill hot water bottle, but keep the water bottle "thin" (easier to manipulate). Fold bottle over syringe containing progesterone and heat for at least one minute; check temperature. After you draw up the progesterone in the shot, recap it and put it somewhere warm for about a minute. You can hold it in your hand on sit with it between your thighs, or if you have cleavage, that’s a great place too! Place the vial in warm water to warm. Wrap shot in wet hot face cloth for a few minutes. Some people prefer to ice down the injection site for 2-10 minutes. Others avoid icing. How much cream should be applied? You just need a "blob" about the size of the end of your thumb applied to the area where you will be injecting. How big of an area should the cream cover? You shouldn't need more than about 1 square inch - you don't rub this stuff in - just put it on there. How long should the cream be on before the injection? 30 minutes to one hour, check the label. Should a bandage or something be used to cover up the area that the cream was applied to? Yes, but not a gauze bandage. You need something to keep the air out. They may supply this type of air occlusive dressing when you buy the EMLA, but if not, just plain old plastic wrap will do just fine. Can it be used prior to any other injections, such as, delestrogen? EMLA can be used for any injection, or before having blood drawn or having an intravenous started. I assume the area that the cream is applied to should be cleaned before the injection? Yes, the cream needs to be wiped off and the injection site cleaned with alcohol or peroxide. The recommended spots are the large muscles of the rear end (back of hip) (the gluteus maximus muscle better known as your bottom). If you have help, lie flat on your stomach, with toes inward - pigeon-toed (relaxes gluteal muscles). Another method is to stand up against a table or other support, with your leg bent, relaxing the muscle, while someone else gives you the injection. Relax the muscles as much as possible. If getting help for the injection, have a newspaper or magazine to be looking at while the whole thing is going on. Wait for the alcohol to dry completely (it causes some of the sting). Don't let anyone blow on it to dry or you'll get germs all over your nice clean site. Keep the dry skin tight and smooth; don't pull up a pinch of skin. Insert the needle into the skin quickly to minimize pain. One clinic recommended having DH put the syringe in like you would throw a dart. Most people recommend injecting fast and steady. 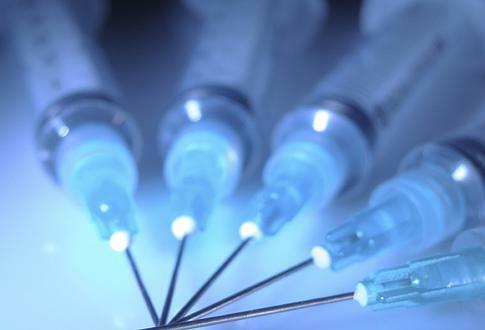 If you feel pain while the injection is in progress, try injecting slower. Withdraw needle quickly and immediately massage injection site. After about 30-60 seconds apply hot water bottle, or heating pad, and massage area vigorously with the flattened bottle as an "in between" layer for at least two minutes. (Heat and massage will break up progesterone and decrease pain). Keep warm compress on for some time. The night after the injection, have partner massage the spot injected the day before. The side effects of progesterone may include (but are not limited to): sore breasts; delayed menses; nausea; vaginal irritation (for vaginal administration techniques); abdominal distention (bloat); weight gain; depression. Note that many of these are the same symptoms as with pregnancy. Because the progesterone supplementation for an IVF-DE starts a few days before DE transfer, you are just beginning to feel the effects of the progesterone after the transfer. This can mislead you into thinking, prematurely, that you are pregnant. You will (in most cases) probably not feel any symptoms of a pregnancy until at least one, if not two to three, weeks after the transfer. **The information contained on this article is for educational purposes only and is not meant to provide or address any specific diagnosis or treatment plan. Any information found on this website is general in nature and should not be substituted for specific medical advice provided by the appropriate health care professional. The use of any information found on this website should be discussed your health care professional before being inserted into your treatment plan. You understand that your use of this website is at your own risk and that PVED, its affiliates, sponsors or contributors assume no liability for any damages arising directly or indirectly from any information provided herein.